You can specify which incoming email messages will be accepted and relayed by Anti-Spam. Only messages to addresses whose domain names are listed here will be accepted by Anti-Spam. 1. Go to Email > SMTP > Internal domains. • Relay IP — The IP address of the email server that the incoming email is relayed to. 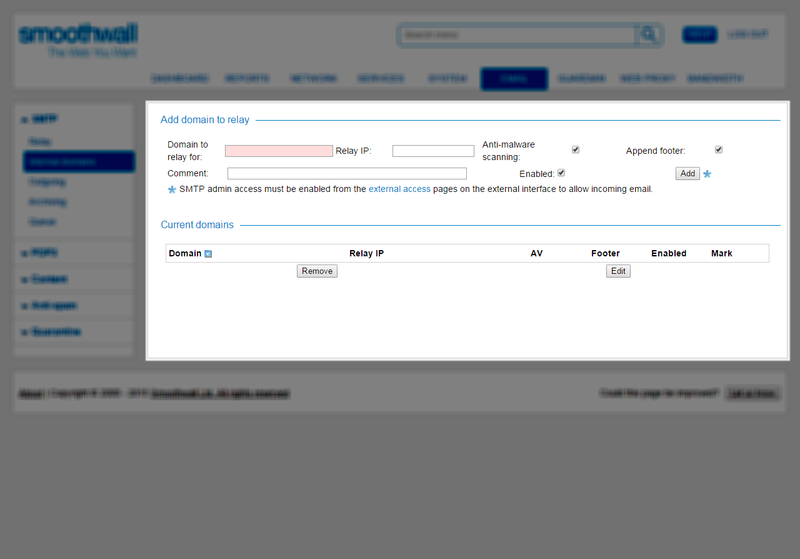 In most cases this will be an internal IP, usually the email server behind your Smoothwall. 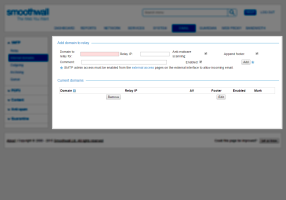 • Anti-malware scanning — Activates anti-malware scanning for email accepted by Anti-Spam for the specified domain. • Append footers — This option appends the text entered in the Email > Content > Footers page below to all outgoing email except HTML and signed email. • Comment — Enter an optional description of the domain. • Enabled — New domains are enabled by default. Clear the check box to create a disabled domain.